Red-backed Shrikes, once extinct in the UK, bred again on Dartmoor this summer, the second successive year of breeding in Devon this century. Once again, a partnership project set up a 24-hour watch to guard these rare birds against egg collectors and disturbance. This year the partnership found itself keeping close watch over two pairs that between them fledged seven youngsters, an amazing result. The birds were protected by a team of RSPB staff and volunteers from Dartmoor Study Group, Devon Bird Watching & Preservation Society and RSPB who spent thousands of hours guarding the birds day and night in all weathers. The protection scheme also involved the Forestry Commission, Natural England, Devon and Cornwall Police and Dartmoor National Park Authority. 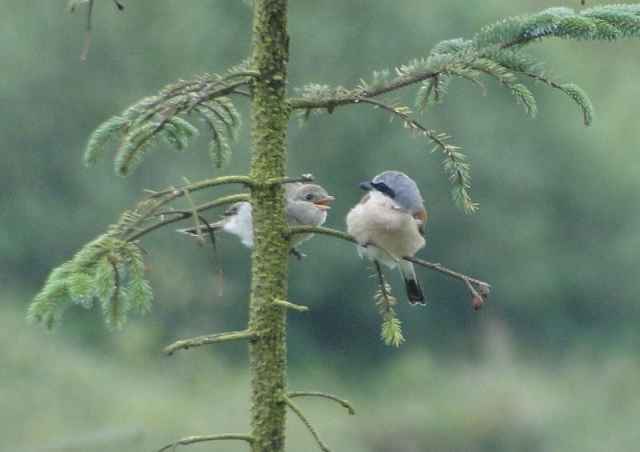 Kevin Rylands, RSPB farmland conservation adviser, said: "We hope this repeat breeding in 2011 and the number of birds indicates a possible recolonisation of Red-backed Shrikes in this country. However, it is early days and, knowing that this bird is the target of egg collectors, we are already planning for 2012 to ensure that any nesting attempts next year are also fully protected as well as making sure there is enough suitable habitat for them. It is unfortunate though necessary that we have to spend so much time and money simply to prevent egg collectors endangering the future of this rare bird. This year's success is testament to the effort of more than 30 volunteers and seven partner organisations working together. We are also grateful to the Dartmoor Sustainable Development Fund, Devon Bird Watching & Preservation Society and the Dame Violet Wills Will Trust for contributing towards the costs of the project, and to Devon and Cornwall Caravan Hire." Male and juvenile Red-backed Shrike, September 2011 (Dartmoor Study Group). Ben Philipps, Forestry Commission Area Forester, said "It's great news and it demonstrates how plantation woodland can provide diverse habitats for a number of species. Today's forest management ensures that these habitats are taken into account and nurtured and we are delighted to have been part of the team protecting these fascinating birds." Colin Marker, one of the dedicated volunteers, said "Having a successful outcome makes all the hours of watching and patrolling and being eaten alive by midges worthwhile! It has been a pleasure working with the various partners from whom I have learnt a great deal about the birds, and I was really thrilled by the result." Local MP Mel Stride, who saw two of the juvenile shrikes himself when meeting with RSPB staff to find out more about upland habitats and birds, said "It was very good to have the opportunity to observe the Red-backed Shrike at close quarters and to see this beautiful bird back on Dartmoor — the project partners have done an outstanding job in protecting it and promoting its return to our shores." Red-backed Shrikes are called "butcher birds" after their habit of impaling some of their prey on thorns and wire fences to eat later. Smaller than Starlings, they are adept hunters, catching insects such as bees and moths in flight and dropping from perches onto caterpillars, ground beetles and grasshoppers, and even taking lizards, mice and voles. These migrant birds winter in east Africa, moving north to breed in Europe. Once found across many parts of southern England in habitat such as hay meadows, hedges, scrub and heath, the UK population declined in the 1930s; it last bred on Dartmoor in 1970 and was finally lost as a breeder in this country in the 1990s. Egg collecting, illegal since the 1950s, accelerated that decline and is still a real threat to the birds that bred on Dartmoor in 2010 and 2011.